The card I have to show you today is a very quick and easy one! I needed to make a 21st birthday card for one of my nieces but didn't have a lot of time. I had a quick browse through some of the cards I have saved on Pinterest for inspiration and came across this card by Jan Nelson who blogs at "The Tiny Blue Butterfly". I have to admit I just copied Jan's card so cannot take any credit for this design. And I'm sorry, but the number dies that I have used are no longer available. I'm hoping that there will be some new number dies in the new catalogue in June! I made a card blank in Smoky Slate with a panel of Whisper White. The turquoise banner is a die from the Swirly Scribbles set - yet another that I've not used enough! 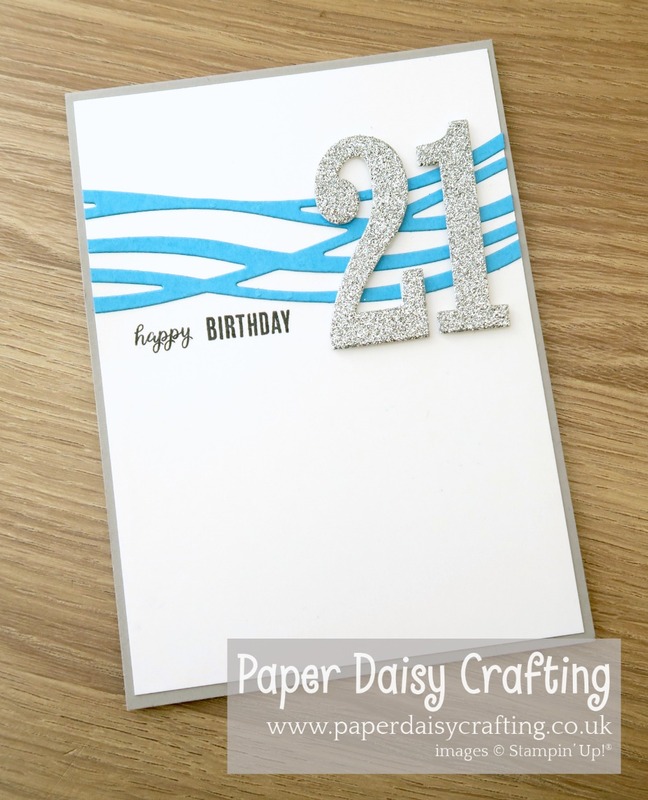 The numbers are die cut from our Silver Glimmer card. And the sentiment is two separate words from the Tabs For Everything set.